As a child I didn’t like the word “immature.” Now as an adult woman, I’m trying to get used to the word “mature.” I’ve noticed as I get older, my skin is getting thinner, developing some darker spots and bruises more easily. After a scare with a pre-melanoma on my leg, I scan my skin often and visit my dermatologist once a year. Recently, I’ve noticed some dry patches, fine lines and a few dark spots. Looking in the mirror, sometimes I’m not happy with the direction my skin is heading–not only on my face, but on my arms, legs and hands. Recently, I received three bottles of DerMend® a brand designed specifically to address the three aging skin problems: dry skin, itchy skin and bruising. Since I have all three skin issues, I was eager to use the products. With the first application, I noticed that my skin had fewer lines and was softer to the touch. Iowa Dermatologist Roger Ceilley, MD, said, “One needs to begin examining the skin on one’s body around the age of 50 for subtle and not so subtle changes.” He believes people focus on their face, but the trap is that the rest of the body may be neglected and then you wind up playing catch-up. For thin, fragile skin I noticed the DerMend® Fragile Skin Moisturizing Formula in a 4.5 oz bottle is affordable at $29.99. It’s made with ingredients that include hyaluronic acid, retinol, glycolic acid, niacinamide and five critical ceramides to help make skin more resilient and fresher looking. When I put a generous dab on my hands and arms, I noticed the product was lightweight and fragrance-free. The cream spreads and absorbs into the skin easily and quickly. Within minutes, my skin looked more supple, restored and felt so soft. Dr. Ceilley said that as we get older, mature skin develops an itchiness. The DerMend® Moisturizing Anti-Itch Lotion comes in an 8 oz. bottle for $19.99. This steroid-free lotion features pramoxine hydrochloride 1%. It provides temporary relief for the itch/scratch cycle. Smoothing this lotion on my skin at night, I noticed it helps calm the skin, so I’m not up scratching, instead of sleeping. Another thing I have noticed recently is I bruise more easily on my face and body. Even though I’m not taking any medications or blood thinners, my skin is more vulnerable to the development of bruises of all colors and sizes. Inside the DerMend® Moisturizing Bruise Formula that comes in a 4.5 oz bottle for $29.99 bottle is arnica oil, alpha hydroxy acid and retinol. Arnica oil contains helenalin, a potent anti-inflammatory. It helps reduce aches, sprains and even arthritis flare-ups. It’s also soothing for insect bites and helps reduce irritation and inflammation to restore and rejuvenate the skin’s natural barrier. I’m hoping that if I continue my daily DerMend® Mature Skin Solutions regime, my skin will continue to look healthy and people will incorrectly guess my age by the look of my skin. Since everybody’s skin matures at a different pace, it’s never too early to intervene and treat skin problems. 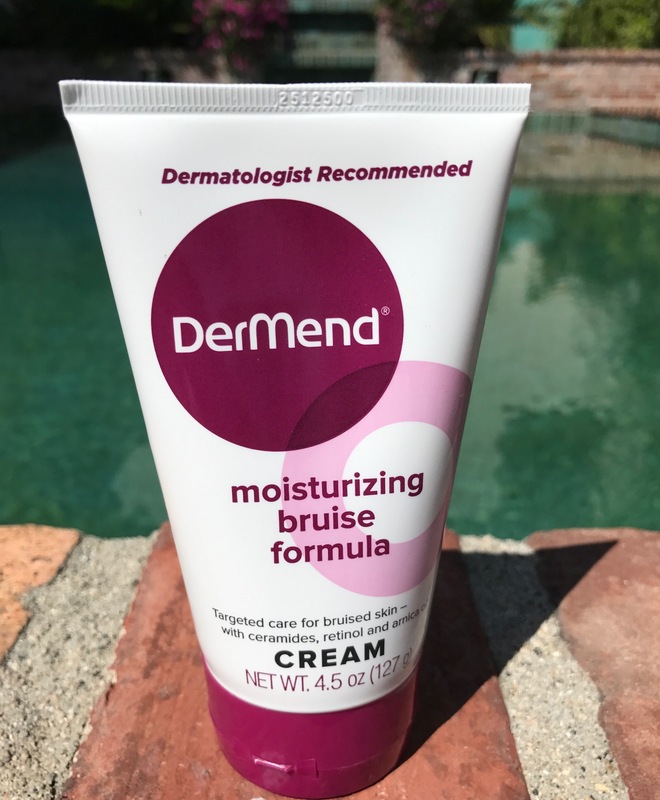 DerMend® Moisturizing Anti-Itch Lotion can be found at Walgreens and CVS, DerMend® Fragile Skin Moisturizing Formula can be purchased at CVS, and DerMend® Moisturizing Bruise Formula is available at CVS, Walmart, Walgreens, Rite Aid, and Meijer locations nationwide. All three products can also be purchased online at LovelySkin.com.